I just wish he hadn't said "Christian scientist". That's a crackpot cult. "Scientist who is a Christian" would have been better. Still, this almost-three-minute video is worth watching. As a review: "Strange Searches" is my term for those things that show up in my site thingie. It shows how someone got to the site, and what search terms they used (if any), and their search engine. Sometimes people just use key words that resemble an actual sentence but seem funny to read, other times, people really do search for something that I consider strange. And sometimes, people want me to see what they put together so they can get their prank on the page, but that trick usually fails. A while back, I wrote an article on what I called "Bandwagon Convictions". I call them that because people jump on the bandwagon because something is trendy or popular. People would become atheists because of the shock value and the ability to get attention, not from actually reasoning to their position. (But the religion of atheism is on the slide, and intelligent people are more likely to be apathetic or contemptuous of such an admission.) In addition to jumping on a causal bandwagon for attention, people join causes because of emotion, a good sales pitch, a desire to please the current lover, to shut someone up or assorted other insincere reasons. Then (as is the case with atheism), people lose interest and start finding other things to do. I believe that there are two aspect to the so-called "gay rights" campaign. One is that "joiners" go along with this because they want to support a cause. Although homosexuals are a tiny percentage of the population, the Gaystapo has a very loud voice, and they play to the emotions of the public. Their biggest trick appears to be pretending that their sexual preference is actually a civil rights issue. This false civil rights movement seems to be less about the "rights" of homosexuals and more about attacking Christians who actively practice their beliefs. Jennifer Keeton was expelled from Augusta State University because she expressed disagreement with the homosexual lifestyle. Unnatural sexual practices and promiscuity led the the term "gay bowel syndrome", which is a serious health issue that homosexuals pretend is simply a derogatory, meaningless term. Other cases of bigotry from homosexuals and their advocates are shown here. Now we arrive at Chick-fil-A. The origins of the current controversy seem to be in an interview with Dan Cathy, the company president. His crimes? Running a successful business, being closed on Sundays, and supporting traditional marriage. The opportunistic Gaystapo happily went ballistic. 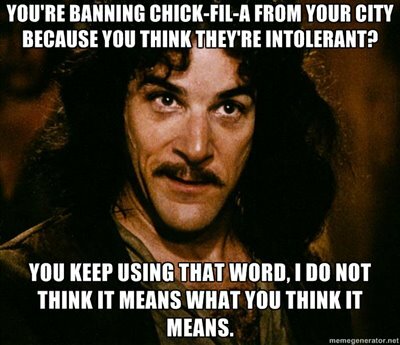 Misotheists and other haters of people who do not keep their Christian values to themselves decided that Dan Cathy and his company needed to pay for this outrage. 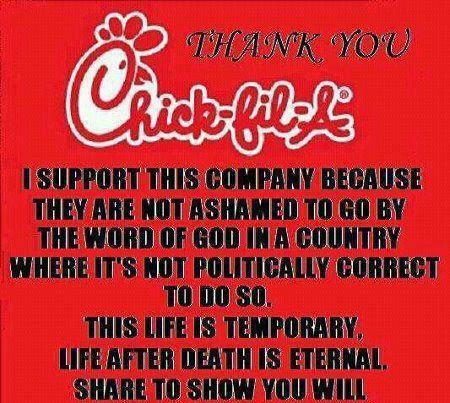 But apparently Chick-fil-A has not expressed hatred for homosexuals, refused them service or done anything other than support traditional Christian values. Leftist politicians seized the opportunity to bash the establishment and cater to the "gay rights" bandwagon crowd, threatening that Chick-fil-A would not be able to open in Boston, Philadelphia and Chicago. Such blatant discrimination is unacceptable, even to the ACLU! In fact, legal experts seem to have a "bring it on" attitude. People are realizing that this is not about alleged "civil rights" at all. Star Parker said, "The vile attacks on the firm and its owners, the Cathy family, should make clear, finally, that the 'gay rights' movement is not about refining and advancing American freedom, but about rewriting American values and advancing, not freedom, but the homosexual political agenda"
If what I hope happens really does happen, the backlash against the Gaystapo and the people who use so-called "gay rights" as leverage against Christians will backfire. Until then, you can be sure that the anti-Christian leftists will leverage people who are manipulated into having bandwagon convictions. Can Atheists and Evolutionists Be Good American Citizens? I suppose it depends on someone's loyalties. Atheist evolutionists do not recognize the Creator as the one who gives rights. The atheistic religion of Secular Humanism has evolution as one of its tenets. Evolution is a religion and it is not science (like we've been telling you). In fact, evolution is a faith-based religion, despite science! People were worried about John F. Kennedy being elected president because he was Roman Catholic, and his loyalty would be to the Pope. Now they're pulling the same stunt about Mitt Romney's Mormon religion. What about the evolutionist? I would be much more concerned with the freedom of Christians if there was an admitted atheist in the Presidency, since there is no God to them, and they are Statists. The “myth of evolution” is the most seditious of all attacks being made upon the foundational core principles of our Constitutional Republic. If one accepts the belief that evolution is fact, one must - then and there - surrender and forfeit his “Americanism” which is defined as the belief that our individual rights and liberties are derived from the CREATOR, are founded in “Nature” , and as such are unalienable (absolute) being beyond the power of all Earthly governments to abrogate. Only in “America”, do the rights of the citizen supersede the laws of the state. This is what “Americanism” is! If there is no Creator, then there can be no unalienable rights derived therefrom! If there are no unalienable rights, then there can be no Americanism (defined above). If rights do not come from God as the Founding Fathers decreed, then they must necessarily come from the state - in the form of granted privileges called “civil rights” or “human rights” as the Humanist Manifestos propose. The dictionary definition of “God” is: “Most High Lawgiver” or “unaccountable, source and author of authority ” . If there is no “God” or “Creator” recognized as the supreme authority, the state then usurps that prerogative. This article is blunt and a real eye-opener. You can read the rest of "The 'Evolution' Myth", here. This picture has been circulating for a little while, and I had to show it anyway. 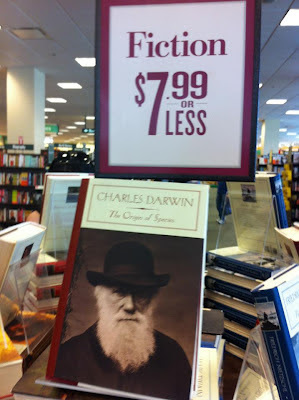 Here you go, proof that evolution is fiction: Barnes and Noble said so! There are many reasons to dismiss the "proof" claim, including employee error, staged picture, prank, someone just shoved it there or whatever. And yet, when it comes to finding excuses to disbelieve in creation science and in the existence of God, people use "proof" that is even less reliable than this picture! Anyway, it's misclassified. Darwin's writings belong in the religion section. It is painfully obvious that reporting to prove evolution is biased. Information is cherry-picked so that inconvenient facts that do not fit into evolutionary presuppositions are discarded. Alternative explanations and theories about observable facts are suppressed. Equivocation on word definitions and other attempts at "moving the goalposts" are rampant, as are other logical fallacies. Worse, evolutionists are downright disingenuous when it comes to protecting their faith. This short video uses evolutionary terminology (from one of the evolutionists' biased sources) to support Intelligent Design.